Sleep affects your focus, mood and memory. Get a new bed today to enhance your well-being! Lay-by: R384** x12 months. R100 Deposit. Credit: R352* x24 months. R470 Deposit. Total R8448. Lay-by: R242** x12 months. R100 Deposit. Credit: R251* x24 months. R300 Deposit. Total R6024. Lay-by: R325** x12 months. R100 Deposit. Credit: R311* x24 months. R400 Deposit. Total R7464. Lay-by: R492** x12 months. R100 Deposit. Credit: R379* x30 months. R600 Deposit. Total R11430. Lay-by: R225** x12 months. R100 Deposit. Credit: R239* x24 months. R280 Deposit. Total R5760. Lay-by: R367** x12 months. R100 Deposit. Credit: R340* x24 months. R450 Deposit. Total R8160. Lay-by: R408** x12 months. R100 Deposit. Credit: R369* x24 months. R500 Deposit. Total R8880. Lay-by: R450** x12 months. R100 Deposit. Credit: R399* x24 months. R550 Deposit. Total R9576. Lay-by: R492** x12 months. R100 Deposit. Credit: R381* x30 months. R600 Deposit. Total R11430. Lay-by: R575** x12 months. R100 Deposit. Credit: R429* x30 months. R700 Deposit. Total R12990. Provides you with back and spinal support for a good night’s sleep. For a soft, yet supportive night’s sleep. For people who prefer to sleep on their side. Luxurious, soft layers giving you support and comfort for a restful night’s sleep. Lay-by: R209** x12 months. R100 Deposit. Credit: R228* x24 months. R260 Deposit. Total R5472. Lay-by: R741** x12 months. R100 Deposit. Credit: R535* x30 months. R900 Deposit. Total R16050. Lay-by: R309** x12 months. R100 Deposit. Credit: R299* x24 months. R380 Deposit. Total R7176. Lay-by: R1075** x12 months. R100 Deposit. Credit: R740* x30 months. R1300 Deposit. Total R22200. Shop online 24/7 @ www.sleepmasters.co.za or apply for credit & lay-by. Terms and Conditions Apply: Offers cannot be used in conjunction with any other promotions. All products and prices in this catalogue are subject to stock availability and price fluctuation E&OE. Unless otherwise stated complimentary products and accessories are not included in the price shown. Valid 15 Apr - 12 May 2019.
CREDIT TERMS* •	Terms and conditions apply. 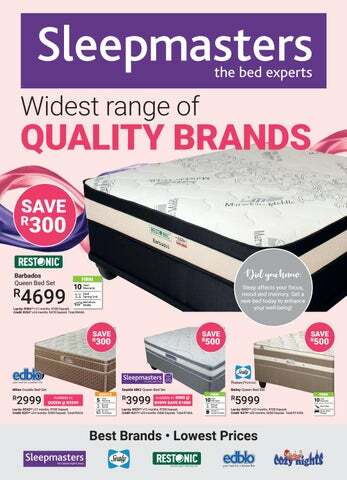 See in-store and on-line @ www.sleepmasters.co.za for details or call 0800 222 888. •	When applying for credit please bring your ID-Book, latest pay-slip, 3-months’ bank statements & proof of insurance (if you have your own). •	INTEREST RATE from 23.75% pa, 10% DEPOSIT, INSTALMENT AND CREDIT PRICE MAY VARY BY CREDIT PROFILE AND LOAN TERM. •	Connect Financial Solutions (Pty) Ltd (Reg no. : 2018/431596/07) an authorised Financial Service provider and a registered Credit Provider (NCRCP11158) trading as Sleepmasters, Abacus Life Ltd and Abacus Insurance Ltd.
LAY-BY TERMS** •	Up to 12 months interest free. •	Lay-By is not available on items of less than R500. •	Requirements – ID-Book/Passport and a minimum of R100 deposit.